SEDSG 2016 — Remote Intelligence, LLC. Our own Rob Schwarz is in attendance at the 39th Annual Meeting of the Southeast Deer Study Group held in Charlotte, North Carolina. 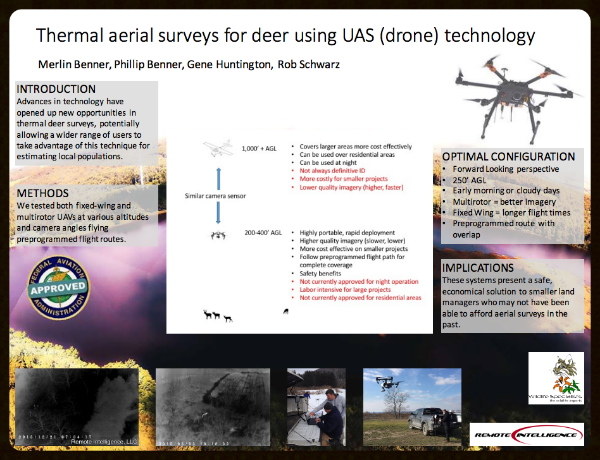 We're presenting some research and developments on the use of thermal imaging via Unmanned Aerial Systems. Be sure to look for our poster and check in with Rob if you're there. We're excited to share our findings with those who work hard to protect and manage wildlife populations. With our Wildlife Biologists, Land Management Specialists and GIS Specialists on staff we help our clients find the best ways to make sure that human, land and wildlife assets are managed well. If you're interested in learning more about thermal technology click here.